[QUOTE]Originally posted by Shuttleman: [B]The following excerpts are from my upcoming book, "Remove Before Flight: Memoir of a Space Shuttle Team Member." I would appreciate any feedback. As a space shuttle team member my mission was analogous to the Remove Before Flight ribbon. This ribbon may be up to 3' long and is used to flag support items temporarily attached to equipment not intended for flight. The red color makes it easier for engineers to see and insure that everything that should be removed is done so before the shuttle launches. I never flew on the space shuttle but I did have the privilege of working on this historical program beginning in 1978 through the last flight in 2011. Inspiration for the title of this book came from the fact that I was the last technician out of the first Shuttle External Tank (ET1) and acquired the ribbon from the tank before flight. This is a personal memoir. I realized, early in my career, that being part of this historic groundbreaking program would not be ordinary - far from it. It has been interesting, challenging and, at times, dangerous but definitely not mundane! I began my journey slowly introducing my passion for woodworking. I designed and, to date, have built over 130 one-of-a-kind shuttle models. These art pieces are made out of a variety of different hardwoods. My hobby afforded myriad opportunities to interact with space shuttle team members, including many astronauts whom I would never have otherwise known. By doing so, I was able to experience the bigger picture and develop a unique vision of authenticity in promoting the space shuttle program as well as having astronauts sign my models. As I found myself in increasingly highly visible situations and, as a NASA contractor, I found myself in some very precarious positions as well. Needless to say, I did have a few 'near misses!' I've written this book with honesty and passion. Hopefully, it will inform, inspire, encourage, motivate, and entertain. You may even find it thought provoking at times. I've also thrown in a few of my "woodisms" which are little philosophical lessons that I learned along the way. The purpose in writing this book is not to bore you with the meetings I attended, the phone calls I returned or the ways I got my hands dirty, but a deep desire to share with this generation and the generations to come what we accomplished with the Space Shuttle to support International Space Station, Hubble Telescope, and Chandra as well as other satellites and payloads. Writing this book has been extremely therapeutic in releasing the 30+ years of both joy and sorrow that I have devoted to my life's work. 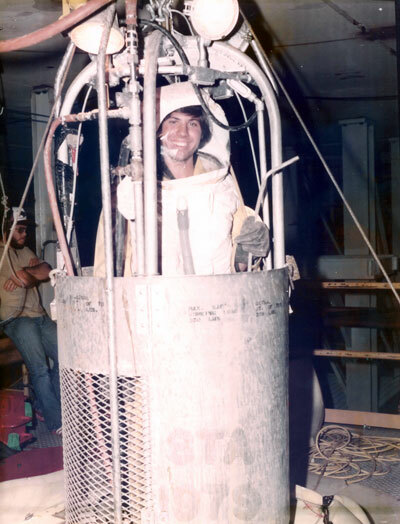 Sample Chapter: [b]Mudman[/b] In 1979, I was working as a mechanical technician performing critical pre-flight testing on the Space Shuttle's external tank structural test article (STA) on the liquid oxygen tank (LOX). 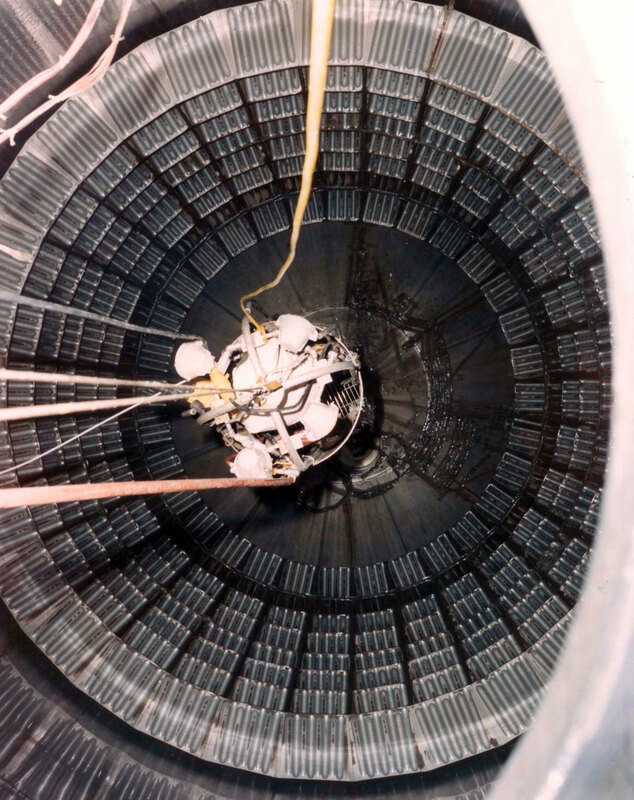 Months earlier, our team had installed pressure-measuring devices known as strain gauges and our task now was to conduct stress analysis testing on the tank and to verify that the weld seams would hold the fuel during the shuttle's ascent. NASA decided to use Barium sulfate (driller's mud) and water treated with a special anti-corrosion additive to simulate the approximate weight of the liquid oxygen. We successfully completed our testing and verified the integrity of the tank. Our next task was to drain the mud from the tank and clean the residue off the walls. 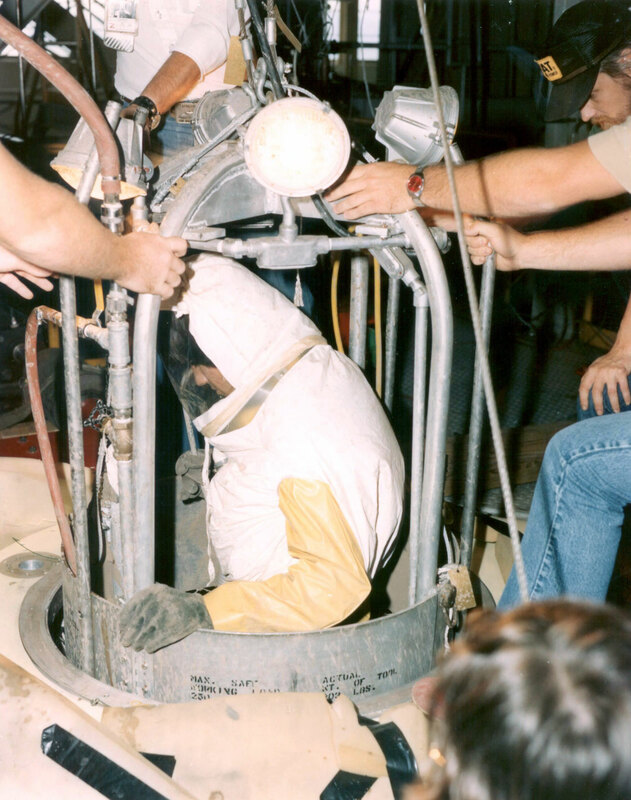 Bendix Corporation had created a three-foot circular platform device called a 'man tube' that rotated 360° on a thin cable system that was designed to lower one person, in a standing position, down through the top of the LOX manhole with a high pressure water hose to spray the walls. The man tube was hooked to a wench cable device that would be manually lowered incrementally as the walls were cleaned. This task was extremely dangerous as it was in a confined space and required a tank entry certification. The man tube had not been previously tested with an actual person. Since this was our first attempt at doing anything like this, and since I was the youngest team member, the thinnest, and looking back, perhaps the most naive, I was selected to be the 'guinea pig' to man rate the man tube. I convinced myself it was safe and we naturally assumed it would work as designed. We were performing the work on a night shift so on-site safety personnel were slim. I donned the white waterproof airtight suit and helmet that included a built-in breathing apparatus and rubber gloves. Feeling like an astronaut anticipating his first mission, I was excited to be performing my first solo job and, ironically as it turned out, almost my last. As I looked down into the tank it was very daunting knowing there was only one way in and one way out. I quickly purged my mind of any thoughts of claustrophobia or falling down into the cave-like bottom of the tank. They manually cranked me down the dark abyss, not unlike being in a casket, ten feet at a time as I dangled in the man tube by one thin cable. Flood lamps attached to the top directly above my head created tremendous heat and glare that invoked a sense of disorientation not knowing which way was up or down. The darkness finally eased as the floodlights from the top filtered through the manhole to light the tank. The outside tank monitor activated the high-pressure water hose and I began to blast the tank walls with water. The intense water pressure against the walls caused the tank to reverberate and increased the noise level dramatically. Without hearing protection, it accelerated my fatigue and complicated the communication process. As I completed my first 360° rotation, the water pressure bounced mud back into my helmet shield and covered me completely with mud. At about 40 feet down and 45 minutes into the process, in a completely confined environment, the air hose in my suit popped off. This horrifying revelation was confirmed when I heard the spring clip from my air hose hit the bottom of the tank with a clink. At that point, I was already overheated, fatigued from the noise and hose pressure, and my head was experiencing a sensation of spinning as if I were in a Twilight Zone. Once I lost the air pressure in my suit, my face shield clouded over, I lost my visual... and I desperately gasped for air. I instinctively grabbed my walkie-talkie, albeit completely covered in mud, and firmly radioed the tank monitor that I had lost my air supply and needed to return to the top immediately! What ensued next was an agonizingly slow process. Since this was a manual system, I relied on someone at the top to hand crank the wench device that would bring me back up through the manhole. The cable inched through the driller's mud, not unlike molasses. During this time, I had very limited oxygen available. I instinctively knew I had to maintain shallow breathing until I reached the top. I also had to leave my helmet on and, thankfully, my certification training had taught me not to panic while in a confined environment. It took at least fifteen minutes for the manual wench device to raise me out through the manhole...that was the longest fifteen minutes I had ever experienced. I was able to maintain positive thoughts and stayed focused. I slowly reviewed all the details in my mind and figured out that the mud had created the problem by lubricating the spring clip on the air hose to my helmet causing the hose to pop off. When I finally emerged, I was covered from head to toe in driller's mud. I was lightheaded from the lack of oxygen, but elated to be breathing fresh air! As previously mentioned, we were on the night shift. Our quality safety team member was present but chose not to write an incident report. We performed our own modifications to the suit and rewrote the procedures. We passed the information on to the next day's shift and they were successful in completing the work. Fast-forward thirty years. Knowing what I know today, I probably would not have agreed to be the 'guinea pig.' What we did was extremely risky and dangerous. This experience was my first close call during my career working on the Space Shuttle external tank...but not my last. It taught me an important lesson. It made me realize how dangerous our work was and reinforced the importance of always being vigilant in performing hazardous operations. By the way, I received an extra .50/hour night differential to perform that task! A NASA photographer was on-site to document the man rating procedure. He took pictures of me going down inside the tank, but when I returned, completely covered in mud including lights and equipment, he had already gone. Although it is not customary for NASA to release pictures of this nature, they did provide a few photos to our quality safety people. I was inspired to document the incident for my own posterity and chose to highjack a couple of the pictures. No one ever knew I had the photos until now. As far as the weight testing was concerned, it was successful. However, the mud corroded the tank after the residue dried. Many man-hours were spent using stainless steel brushes to remove the corrosion. Fortunately, this tank was used for testing purposes only and not intended as a flight article. If you ever hear me referred to as "mudman," you now know the whole story.